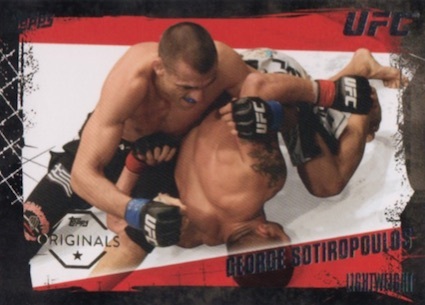 Given the name, it should not be surprising that 2015 Topps UFC Chronicles goes deep into the past and present of the Ultimate Fighting Championship. Each hobby box features five total hits and a large amount of inserts and parallels. 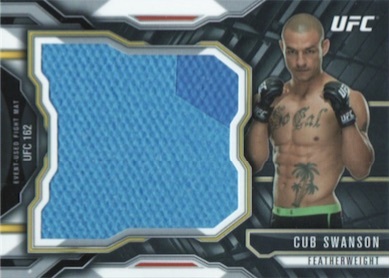 The 300-card base set is quite large for a UFC product and goes well with the 40-card packs. Averaging five per pack, the parallels include Silver, Green (#/288), Black and White (#/188), Gold (#/88), Red (#/8) and Sepia (1/1). 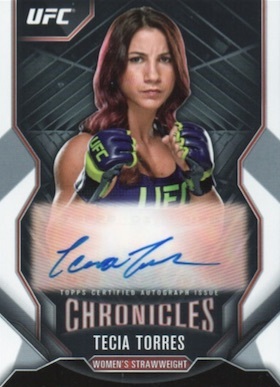 Collectors can find several autograph options in 2015 Topps UFC Chronicles. 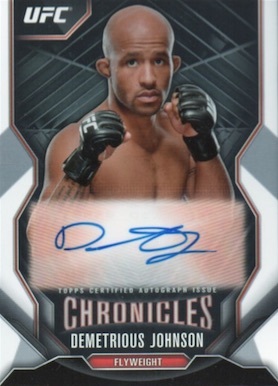 Chronicles Autographs feature 50+ fighters and UFC personalities with additional variety present in Red (#/8) and Sepia (1/1) parallels. Octagon of Honor showcases the truly elite of the sport's history and are numbered to 25. 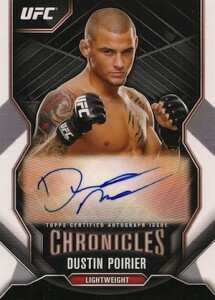 Also limited to 25 copies, Victorious Debut and Fighting Legacy Dual Autographs offer more signed choices. Combining a signature with a piece of fighter-worn relic, several autograph relics are also available. Chronicles Autographs Relics utilize a vertical layout and include 30+ fighters along with Red (#/8) and Sepia (1/1) parallels. The Autographed Jumbo Fight Mat Relics insert is exactly as it sounds with a sticker autograph and oversized piece of canvas. Numbered to ten, Fighting Legacy Dual Autograph Relics double the signers and relics. 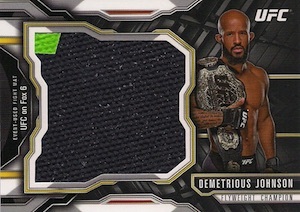 Closing out the hit options in 2015 Topps UFC Chronicles, relics come as either fighter-worn or manufactured. Chronicles Relics include up to 40 fighters with fighter-worn pieces. Red (#/8) and Sepia (1/1) parallels are also available. Chronicles Dual Relics pairs two fighters and relics on the same card and Jumbo Fight Mat Relics opt for large canvas pieces. Lastly, Victorious Debut Manufactured Medallions average one per case and highlight the fighter's method of victory in their first match with a special commemorative medallion. Not just about the autographs and relics, inserts are plentiful in the release. Four main inserts are available and they average three per pack. 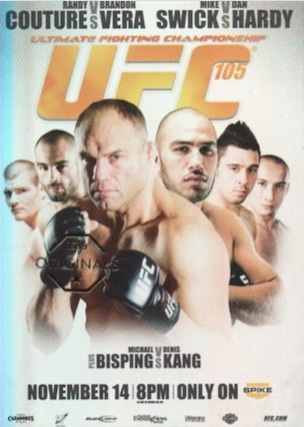 Victorious Debut returns from 2009 UFC Round 1 with new fighters that began their careers as winners. Octagon of Honor includes up to 15 all-time greats of UFC, including Hall of Fame members, title holders, The Ultimate Fighter winners and record breakers. Finally, Climbing the Ranks focuses on the future and Fight Poster Review features mini versions of notable fight posters from the past. 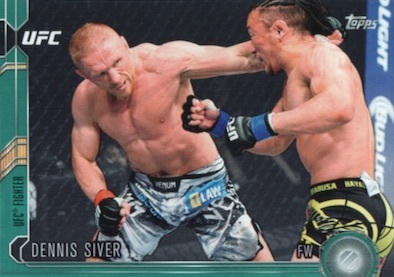 2015 Topps UFC Chronicles also looks back in a tangible way with a mix of buybacks. 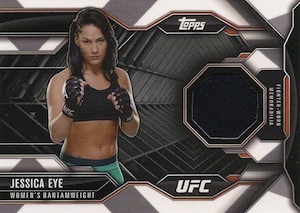 This includes single cards with foil stamps and redemptions for full boxes, packs and sets from previous Topps UFC products. Good: Five hits per box, detailed base set with action photography. Bad: Main design is very generic, more sticker autographs, base hits aren’t numbered. 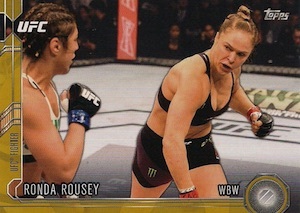 The Bottom Line: Mixing the world of set and hit collectors, 2015 Topps UFC Chronicles offers both a deep checklist and five hits her box. The problem is that the price is a little high for set collecting and the quality is a little low for hit-based collectors. 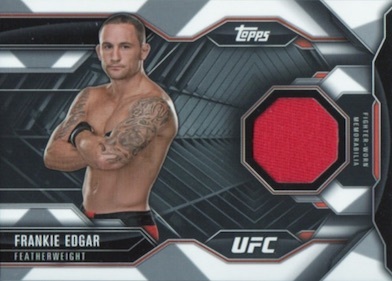 In my opinion, Topps has struggled to carve out a specific identity for many of their UFC brands. This is very clear in 2015 Topps Chronicles as the base set could honestly be from any product. Having said that, the strength of the release comes from the depth and action images of the base set. Inserts offer more collecting options but elect to go with posed images instead of more enticing shots of the fighters. For instance, in Victorious Debut, the first bouts for several key names are covered. 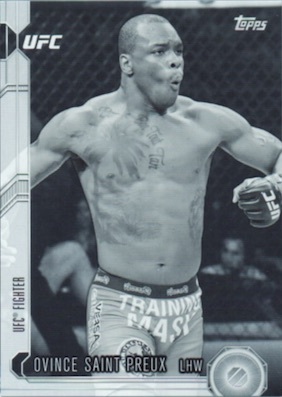 However, it would have been a much better insert if the cards actually showed the fighter celebrating that win versus a more plain, staged shot. It is these little things that help push a product from average to notable. In terms of the signed cards, sticker autographs are the norm and that will likely remain the case at this price. One thing I did notice is that they are one of the few instances where the Chronicles brand name is prominently displayed. While the worn Relic I pulled continues the boilerplate disclaimer on the back that provides no details about the origin, I appreciate that the Mat Relics at least specify the specific UFC event where the mat was used. To me, buybacks are generally a weak way to add more to a release with little effort. Not everyone likes the stamping of old cards, but many appreciate seeing the previous releases. 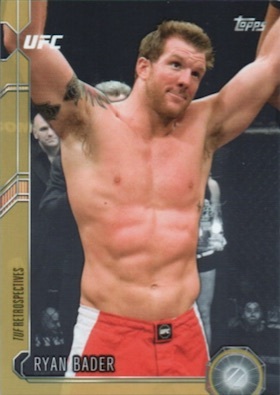 Because UFC card collecting is still in the early years, there is no history to tap into and pulling a stamped “Originals” base or insert card from just a few years ago is a little disappointing. Given the huge base set and 56 signers for the main autograph set, quantity is definitely covered in the checklist. Also, most of the big names, including Conor McGregor and Ronda Rousey, are featured among the autographs. 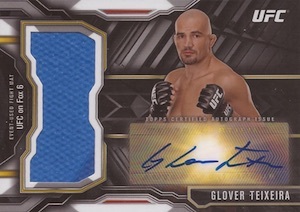 The problem arises as none of the base autographs are numbered and the top names appear to be fairly limited in comparison to the more plentiful fighters. Numbering the hits would at least allow collectors to see an exact picture of what they pulled and shine a light on the short prints. 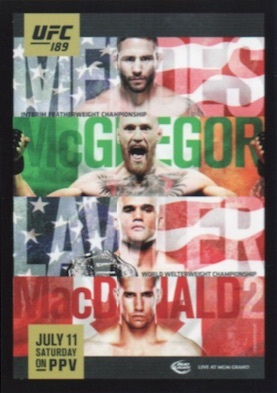 UFC remains a niche option and priced at around $90-100 for five hits and no specific guarantee on autographs, it can be tough to achieve value. Sure, there are some big names and low-numbered parallels, but those breaking by the box won’t likely see these. Chronicles is an entry-level product with hits added in and the box price is hard to justify. A lot of cards come out of 2015 Chronicles in both sheer volume and variety. The generic look of the base set did tend to get stale but the other options were more exciting to review. On this front, Chronicles can be fun. 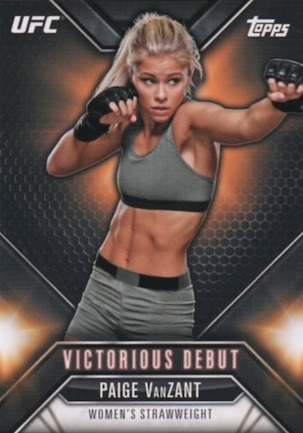 Still, I would hope that Topps can do more to give their UFC brands a specific identity in the future. I love the detailing into the this product. I also like the fact the base set is configured of more cards, along with inserts. It’s an overall nice set! Too Pricy! Should be around $60 per box. The design of the base looks too much like the more recent champions product. Time to go back and get innovative. Re-introduce cage relics…, Bring Back Finest or at least insert it into the product. I really like these cards and it didn’t hurt that I pulled some really nice cards as well. Seemed like a nice value for what I spent. Overall very happy with this product.